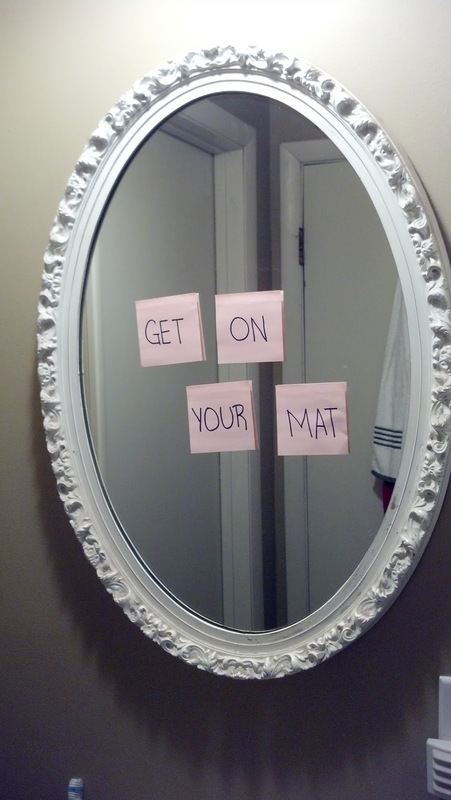 Sometimes you have to give yourself a subtle reminder to get on your mat. It’s that time of the year. There’s shopping and decorating and holiday parties. There’s family gatherings and festive meals. There’s spiritual rituals and secular traditions. And it’s all fabulous…on paper. The upcoming holiday season looks wonderful on glossy magazine covers and in thousands of new pins. All the recipes look yummy and gift-buying guides are full of inspiration. All we have to do is make time for the holiday hoopla. And pay for it. Got your holiday stress on yet? I’ve had some pretty miserable holiday seasons. And I’ve learned one very important thing from them. It’s the thing that has kept me from driving head-on into a house trimmed with perfectly straight icicle lights, right through Santa and his eight light-up reindeer. Before you deck the halls, trim the tree, wrap the gifts or stuff the turkey, take this little piece of advice. Take ten, twenty or thirty minutes a day for yourself to recharge. Not only will you feel less like strangling an elf, but in a moment of clarity you might just figure out how to get those antlers to stay on your dog’s head. The truth is, in this time of giving, the greatest gifts you can offer are your presence and your inner light. And you won’t find either one unless you crawl out from under that pile of tinsel and cultivate your own serenity. Trust me, when your youngest finally climbs into Santa’s lap and smiles instead of running away screaming about the scary red man, you’ll want to be here and now. Practice, so you’ll be ready for the really fabulous stuff that comes in moments, not in boxes. And however you celebrate the return of the sun, I wish you a holiday season full of peace, joy and Adho Mukha Svanasanas.